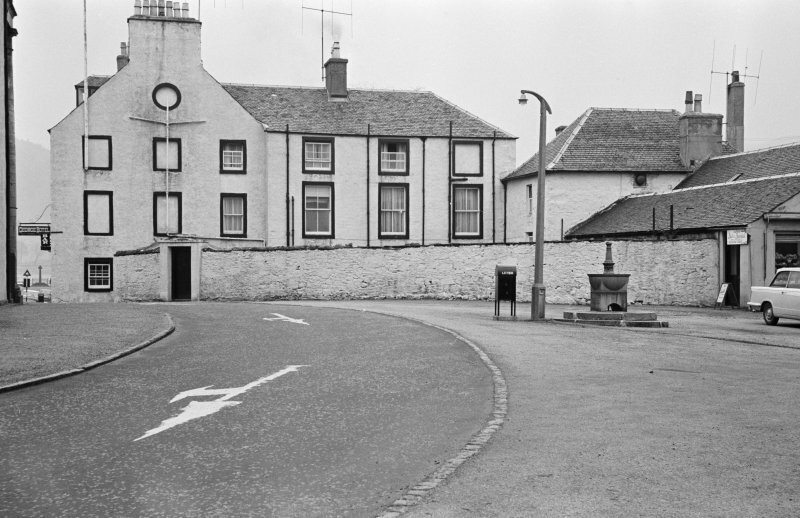 Argyll, Inveraray, Main Street East, George Hotel. General view of entrance front. 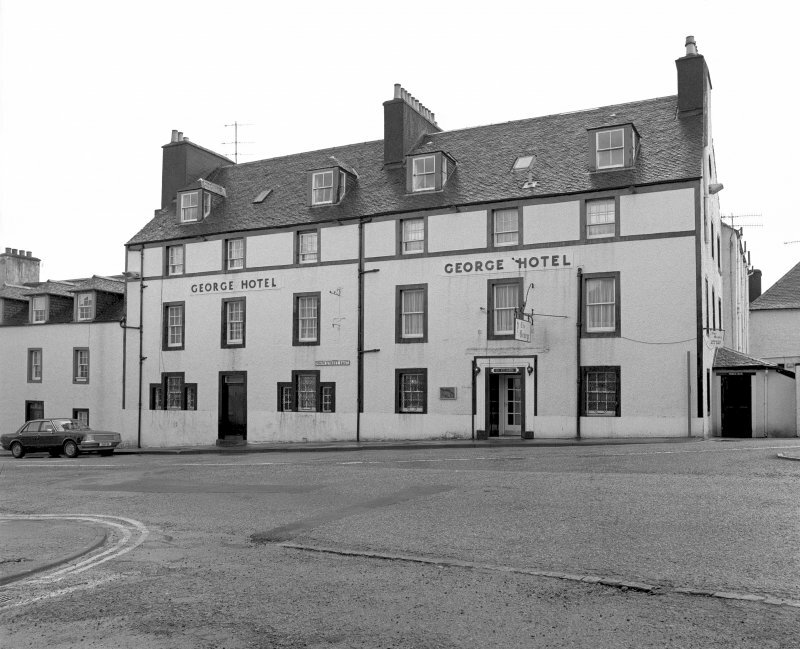 Inveraray, North Main Street, George Hotel. View of entrance to kitchen. Photographic survey of buildings and sites in Inveraray, Argyll, by the Scottish National Buildings Record in 1962. George Hotel, north half (P on fig.). Three-storeyed house forming exactly half of a six-bay block, 23m by 9.75m overall, designed by Robert Mylne in 1776 and begun by the mason John Brown in the following year as 'two Large Houses, at the end of P(rovost) L. Campbells, the one intended for a Highland Church'. 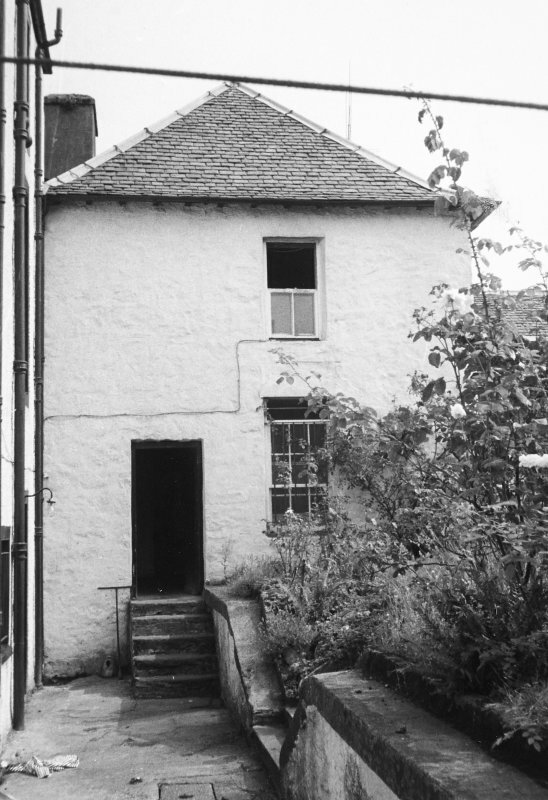 Two years later the lawyer Neil MacGibbon, subsequently twice provost of the burgh, applied for a lease of 'the second and third floors with the garrets of that new house lately built by Your Grace and adjoining Provost Lachlan Campbell's house', and in 1780 he was granted a tack for 57 years, 'he finishing the house to his own mind'. The ground floor of this building was used as the Highland Church until the occupation of the adjacent parish church (No. 37) in 1802. This house was occupied by the MacGibbon family until 1876, and from 1905 to 1930 it was used as a schoolhouse; thereafter it became a boarding house, and was added to the adjacent George Hotel in 1954 (en.8*). Both houses have a projecting base-course which because of the slope of the street is l.5m high at the N end, and they have narrow ashlar quoins, beginning at the N angle above the junction with Lachlan Campbell's house, and sharp-arrised openings. A vertical band marks the central division, where the mid-wall is also indicated by a chimneystack, and the second-floor windows are framed between a continuous ashlar band at sill-level and an eaves-course directly above. The ground floor of the N house has a central door with rectangular fanlight, flanked by tripartite windows with low side-lights, which in the S window are dummies. The original glazed sash-window of the S ground-floor opening in the rear wall, with a rubble surround and five vertical iron stanchions, is now visible in the lounge bar of the hotel. The interior has been extensively remodelled, with several doorways inserted in the S end-wall, and the ground floor, which measures 10.lm by 8.2m internally, retains no evidence of ecclesiastical use. A central corridor which formerly led to a dog-leg stair at the rear (removed in 1985) was presumably inserted after 1805 and is spanned by an elliptical timber arch springing from pilasters with moulded caps. The original means of access to the upper floors is not certain. The outlines of a former wash-house and the open paved area separating it from the house are indicated in the lounge bar at the rear by their respective floors of quarry-tiles and slateslabs. George Hotel, south half (Q on fig.). The frontage, whose ground floor was occupied by the Lowland or English Church from 1783 to 1802, resembles that to the N, but the door has no fanlight and the windows are of normal type. The S gable-wall, facing Church Square, has three window recesses, all but the E one dummies, at each of the upper levels, and a circular recess, typical of Mylne's design, in the gable, which is surmounted by a wide harled chimneystack. At the S end of the rear-wall, with its main front projecting 0.5m beyond the S gable-wall, there is a three-storeyed three bay wing measuring 11.8m by 6.7m and hip-roofed at the E, added some time after 1807. The interior has been much altered although some panelled doors and shutters are preserved on the upper floors. An open-well geometrical stone stair with moulded mahogany handrail occupies the Wend of the wing, and the original access to the upper floors is uncertain. Before 1807 there was an outhouse at the E end of the back yard, whose alignment controlled that of the wing added between it and the main building, but it has been replaced by a modern dining-room extension.